This wonderful French recipe has been sent to me by Esther who runs a gorgeous Chambres et Tables d’Hôtes named Mas d’Oléandre in the Languedoc-Roussillon Region. This soup is so amazingly rich in flavor and due to its color it looks very festive. A true eye catcher especially when served on white dinnerware/china or in a transparent glass. Wash the beetroots in cold water, cut the stalks to 2.5cm and leave the root at the bottom. Beetroots tend to “bleed” and lose color if the skin is broken or removed before or during cooking, so it is best to cook them whole in their skins until tender. You can also choose to use cooked beetroots which will need additional cooking for approx. 20 min. Once the beetroots are cooled off, you can easily remove the skins. You may want to use rubber gloves to avoid staining your hands. Mix the peeled beetroots with the lemon, mustard, cream and crème de cassis. Then purée the ingredients with a hand blender or puree in batches in your blender. We set the beetroot purée aside and take out a stockpot to make a roux. Melt the butter over very low heat and add the flour, begin stirring immediately. After 1 minute, start adding small portions of vegetable stock. Bring the mixture of roux and vegetable stock to a boil while stirring. 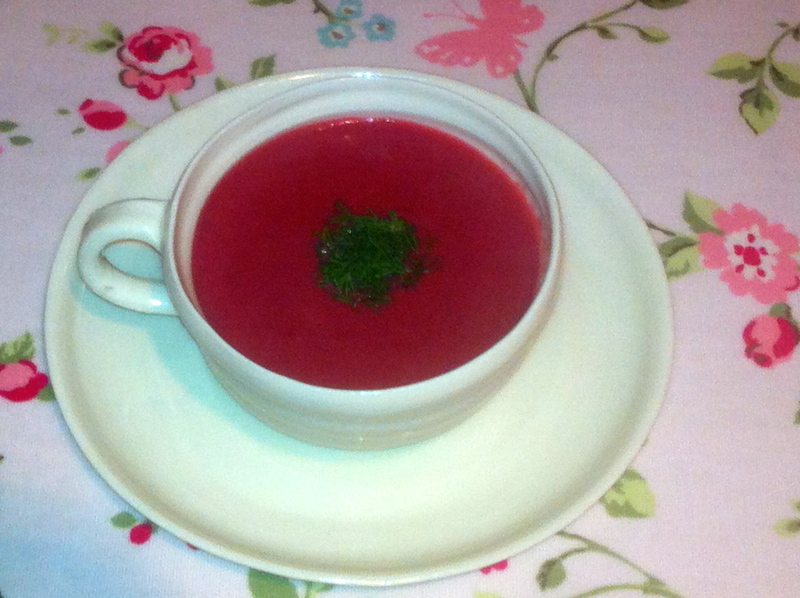 Stir in the beetroot purée and heat the soup over low heat. Serve with some lovely fresh dill and enjoy.